According to Gartner, mini notebooks constituted less than 18.0% of the total mobile PC market in the second quarter of 2010, down from 20.0% of the total market at 2009-end. Gartner expects mini notebooks market share to drop to approximately 10.0% by 2014.
via Near-Term PC Growth Not Visible – Yahoo! Finance. Speculation about the iPad production ramp indicates that the iPad will ship about 14 million units this year and 36 million next year. Projecting a forward growth rate of 50% and adding the Gartner forecast above gives us the graph on the left. 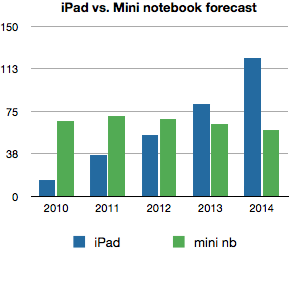 The iPad (plus competitors) will likely overtake the sales of mini notebooks as soon as 2012. The collapse in netbook sales is likely to be much more rapid than Gartner suggests. via Research In Motion: MKM Still Bullish; Cites Growth Outside U.S. – Tech Trader Daily – Barrons.com. Torch selling 500k units a month may be good news to RIM but it’s hardly a barnburner. The news about Nokia losing share to RIM is another curious data point. First, because it identifies two competing smartphone classes (E-series and Blackberries) as “messaging phones”. That’s like saying that HP is losing share to Dell in the “email PC” business. Though the classification of general purpose devices by single uses is probably fair here since these devices are not much good for anything else. If we add Apple’s 230k “activations”, Android’s 200k, Symbian’s 300k and estimating 130k for RIM adds up to 860k per day. Gartner is estimating the global PC market to total of 367 million units this year (though it may need downward revision based on recent data). If the 1 million/day benchmark holds, and all indications are that it will, then the total smartphone/iPad/touch market will be greater than the total PC market next year. Sony Corp., said yesterday it hasn’t decided yet whether to offer its own tablet computer. It needs to be a “very appealing product that is going to be widely accepted, as opposed to a me-too product,” said Kazuo Hirai, president of Tokyo-based Sony’s Networked Products & Services Group. Hirai said 23 companies are planning to bring tablet computers to market, making a price war inevitable. I’d bet that Sony will soon join the stampede to make iPad knockoffs. They probably did not read today’s Appleinsider piece on Apple’s plans to increase iPad production to 3 million units per month. On September 1st, Apple announced that 120 million iOS devices were sold to date. We also know that 3.2 million iPads were sold. If we assume about 8 million iPhones and 4 million iPads were sold during August and July, the total number of iPod touch sold is 45.2 million. That is 37.7% of total units. In April I wrote that 41% of all iOS units sold were iPod touch to date. The expansion of iPhone distribution plus the addition of iPad as reduced the platform footprint for the iPod, but it’s still a sizable chunk. More than one in three iOS units in use are non-cellular devices. As the iPad rolls that number could move toward 50%. LG has reportedly told Korean sources that “it expects WP7 to outperform the two rival smartphone operating systems” – one of these platforms is definitely Android (I’m not sure about the other platform LG is referring to; Symbian? iOS? BlackBerry?). 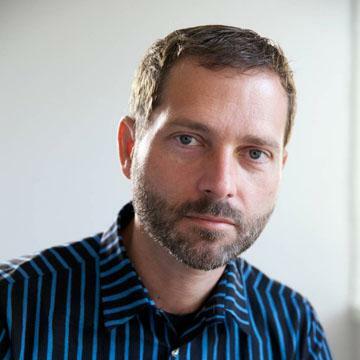 via LG to bank heavily on Windows Phone 7, says WP7 will outperform Android » Unwired View. While Samsung believes WP7 is doomed, LG believes it will RULE! This might go some way to explain why LG is in such dire straits when it comes to smartphone share.